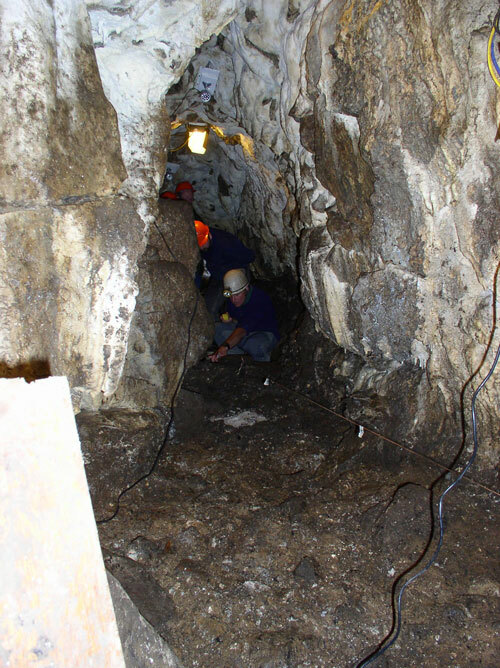 Please forgive the delay in uploading this update on fieldwork at the High Pasture Cave site. 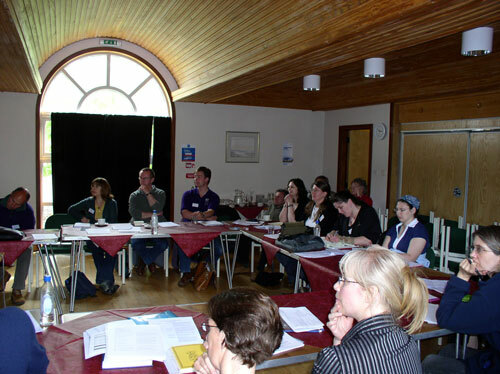 Organising the Specialists Meeting and Seminar held last week at Sabhal Mor Ostaig on Skye, and the Open Days during early June, consumed any available time in the evenings! The first set of Open Days to be held at the site this year have been blessed by wonderful weather. 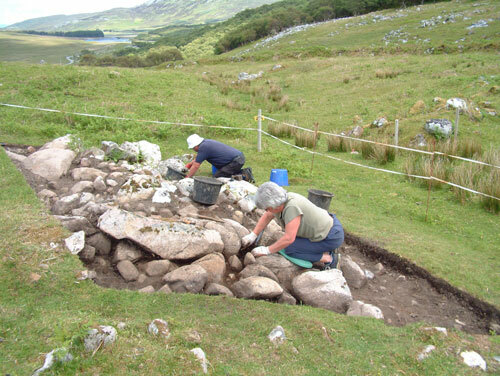 Although we erected the marquee in case of bad weather, John and Val Lord were able to demonstrate their prehistoric craft skills in an open environment. Throughout the event we had a regular flow of visitors to the site and on each of the mid-week days we hosted visits from Primary Schools from Skye including Sleat, Broadford and Struan. Activities including flint-knapping, working with nettle fibres and animal sinew, fire-making and spear-throwing were enjoyed by all, while the odd Mammoth repeatedly came under fire from the spear-throwers!! Children and teachers from Broadford Primary School trying their hand at spear-throwing.....the Mammoth managed to escape on this occasion! The children also had the opportunity to have a go at wet-sieving archaeological deposits from the site and were given a guided tour of the immediate archaeological landscape by Sarah Kay - Highland Council Ranger for Skye & Lochalsh. Please may we once again convey our sincere thanks to John, Val and Sarah, for making the event such an enjoyable experience; and to Ann and Mike Kibby, for assisting with guided tours of the archaeological site. 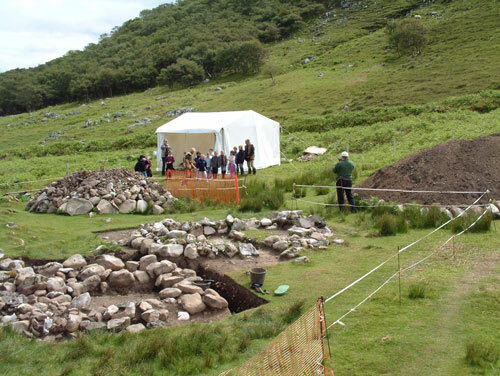 The fine, sunny weather also held out for our first meeting of specialists involved with the project and for the seminar - Underworld: The Use and Function of Underground Places during the Atlantic Scottish Iron Age. 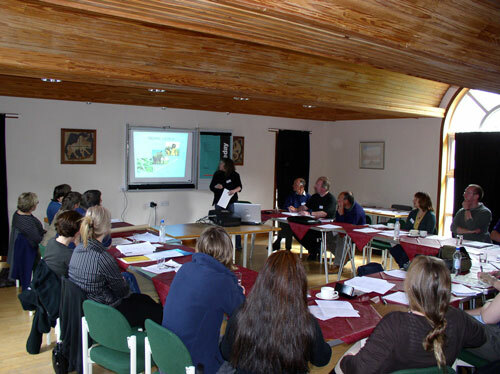 Both events were held at Sabhal Mor Ostaig in Sleat, Skye, which is a fine venue with on-site accommodation, food and conference room facilities, all set in wonderful and inspiring surroundings. 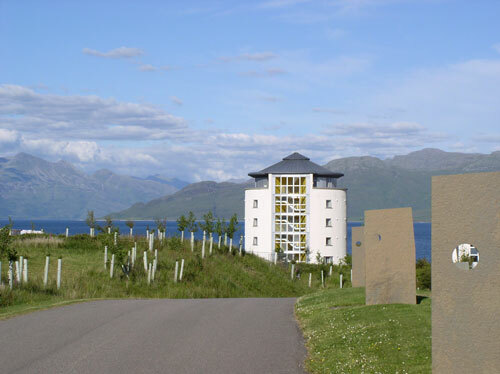 A big thank you to Carlotta Graham and all the staff at Sabhal Mor Ostaig for making our group so welcome and helping to make the events a great success. Attending the Specialists Meeting were Rod McCullagh, Ann MacSween and Ruby Ceron-Carrasco (Historic Scotland); Jo McKenzie (University of Stirling); Sandra Pratt, Fiona McGibbon, Laura Sinfield, Kath MacSweeney and Sheena Fraser (University of Edinburgh); Janet Montgomery (University of Bradford); Carrie Drew and Mandy Jay (University of Durham); Jane Evans (Isotope Geosciences Laboratory); Fraser Hunter and Dawn McLaren (National Museums of Scotland); Mike Cressey (CFA Archaeology Ltd); Jane Downes and Martin Carruthers (UHI Orkney); Nick Card (Orkney Archaeological Trust); Roger Miket, Anna Ritchie, Martin Wildgoose, George Kozikowski and Steven Birch. The meeting was a great success, both in bringing together such a core of people under one roof and in discussing the fieldwork and post-excavation analysis that has taken place so far at the site. 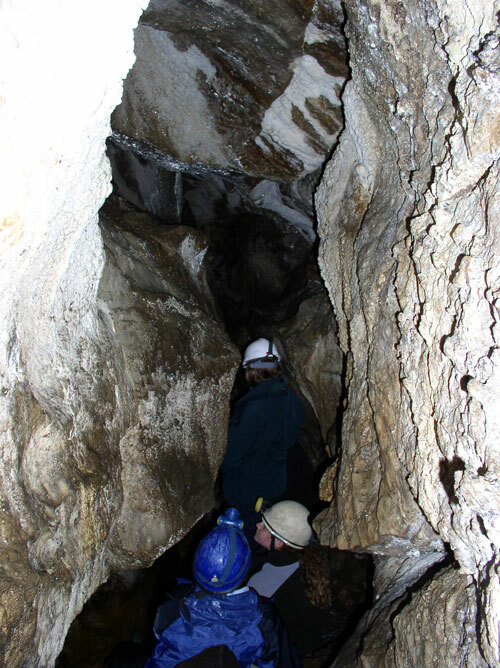 In particular, the visit to the High Pasture Cave site on the Friday afternoon allowed the specialists to glimpse at first-hand what is quite a difficult site to understand - primarily due to the complexity of the archaeological deposits and in understanding what is very much a 3-D set of related features. The meeting also allowed us to review the road ahead - working through the final 2 years of fieldwork, and discussing aspects regarding final post-excavation analysis and publication. 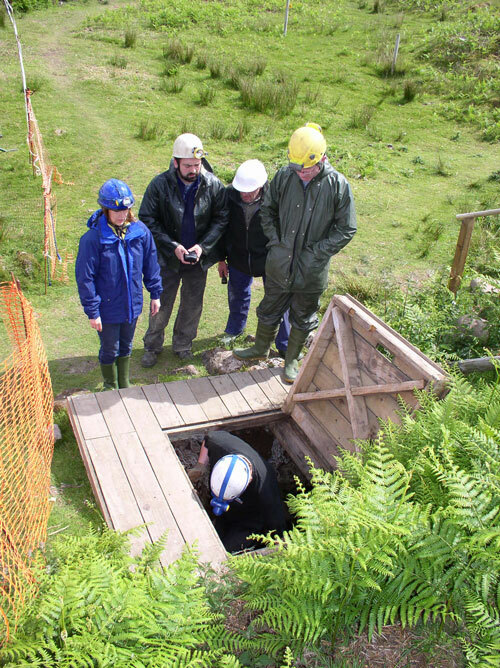 Including the core of specialists and guests attending the function above, a total of around 60 people were present at the seminar discussing matters of the Iron Age Underworld, which focused primarily on souterrains, underground wells, natural caves and other features below ground. 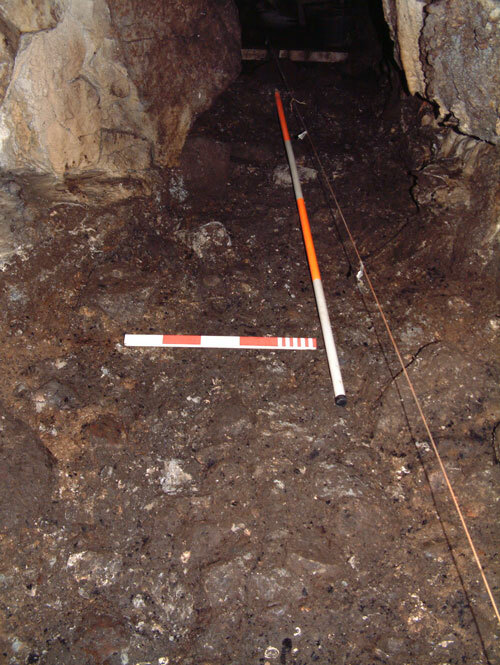 Although a major core of the presentations related to work undertaken at the High Pasture Cave site, there were also papers delivered on the mysterious underground structure at Mine Howe in Orkney, Orkney souterrains in their wider context, a general introduction to underground structures and features in Skye, and a more scientific paper addressing recent research into the mobility and diet of prehistoric people in the Hebrides and Northern Isles using isotopes. The chair for the morning session was Rod McCullagh of Historic Scotland, while Anna Ritchie chaired the afternoon session and final discussion. We are most grateful for Rod and Anna’s contribution to the whole event, and may we also say a big thank you to all of you who attended the seminar. 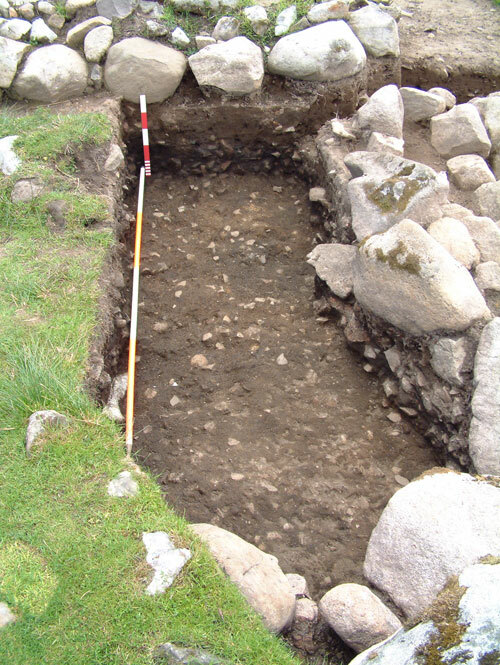 We have been very fortunate on site this year to have experienced a more stable period of weather throughout the late Spring and early Summer, which has allowed us to progress well with excavation. There has also been a steady core of volunteers assisting us on site, both from the local community and from further afield, including students from Mainland Universities. We are very grateful for your continued support. 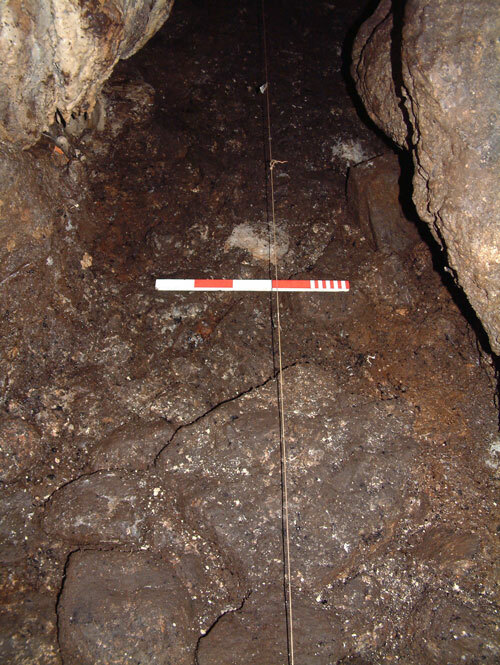 Excavations are now well advanced in Trenches 14 and 15, which are investigating aspects of the burnt mound/spreads and the forecourt, which lies between the stairwell leading into the natural cave and the cavers entrance to the cave that was entered for the first time in 1972. In Trench 14, small trenches adjacent to the excavated shieling structures is uncovering more of the burnt mound/spreads, deposits of which have produced sherds of pottery and a vitrified ceramic crucible fragment. 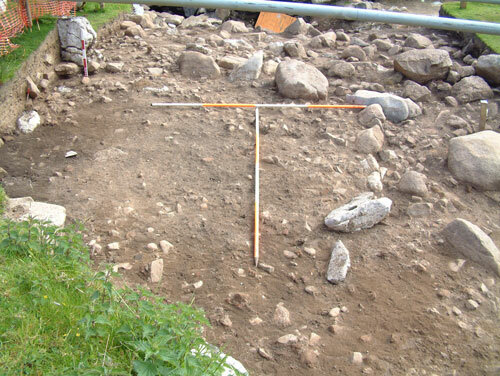 Around one metre of earlier archaeological deposits has been revealed below the shieling structures, which represent some of the most recent human activity at the site. Although we cannot be certain of the date that these structures were built, it appears that they were certainly in use around the middle of the 19th Century AD. Excavations within Trench 15, which is investigating the forecourt area outside the stairwell, is also progressing well. 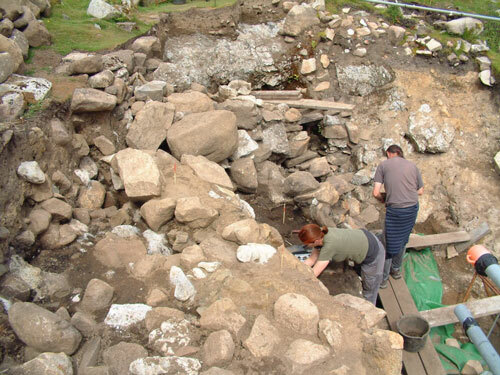 After removing the turf and the first archaeological deposits, we started by dismantling a stone-built wall that is most likely post-medieval in date. The image below shows the remaining orthostat stones within the wall, that had been underpinned by locking stones to keep them upright. 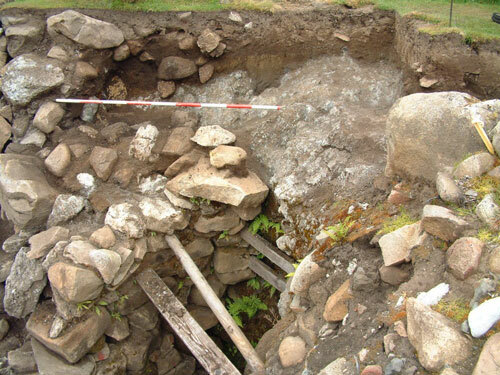 The remains of the wall were removed after recording, which revealed several areas of distinct deposits in the trench including areas of fire-cracked stone, jumbles of large granite and limestone boulders, and what appears to be a second revetment wall at the south-west end of the trench. The image below shows some of these features of the trench. 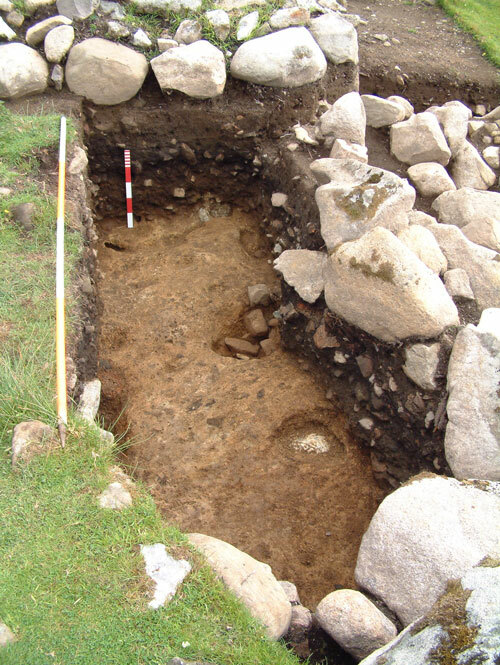 Elsewhere at the surface, we have opened a new trench (Trench 18) to investigate what appears to be a stone revetment to the northeast of the stairwell entrance - adjacent to what may have been the main route of access into the site during prehistory. 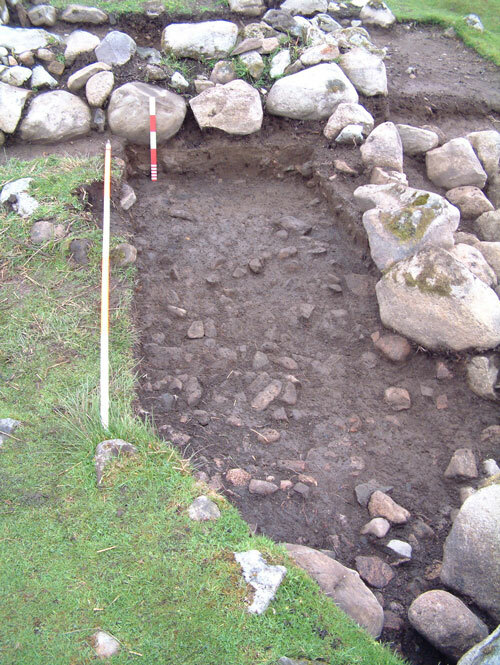 The trench has been de-turfed and the stonework cleaned ready for drawing. The image above shows the location of Trench 18 in relation to the proposed access to the site and to a possible circular structure to the northeast of the stairwell. 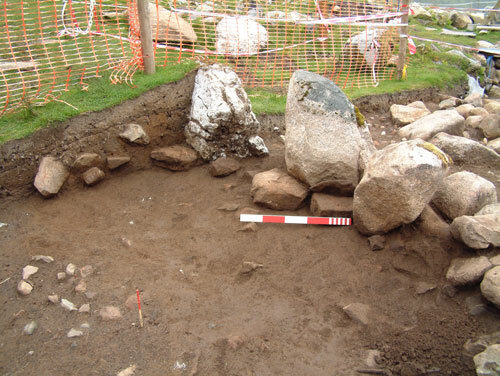 Within the trench we have uncovered large spreads of granite and limestone boulders, some of which may form revetment walls holding back deposits of burnt mound/spreads (see below). After drawing, we will start to peel back layers of stone to hopefully reveal these features in more detail. 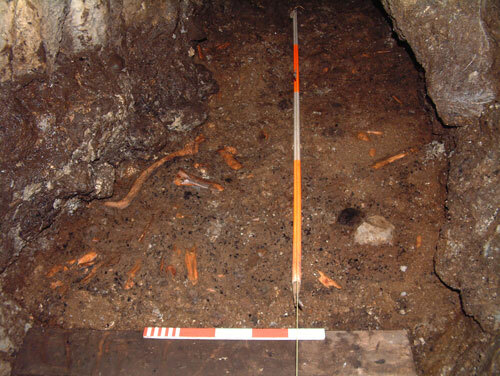 Excavations within Bone Passage (Trench 17) have been progressing steadily. The archaeological deposits we are removing in the north end of Bone Passage appear to be quite different to those at the south end, adjacent to the base of the stairwell. There has been fewer small finds recovered from the trench, although we have removed several stone tools, degraded animal bone fragments and shellfish remains. We have been working through several layers of heavily compacted fire-cracked stone and larger granite and limestone cobbles. Between two larger slabs of stone, possibly forming a basic form of paved walkway through the passage, we have recovered a corroded iron object. This appears to be the remains of a socketed iron axe, of similar form to the type of axe cast in bronze in the preceding Late Bronze Age period. The object will require conservation and x-ray analysis to confirm that it is indeed an axe. However, if it is, then this is a rare find and there have been few recovered from the British Isles from well dated contexts. The axe is quite small, with a total length of around 75mm and approximately 50mm across the blade. Of similar form to the earlier bronze cast axes, these items would have been more difficult to manufacture from iron and would have required a significant investment of time. They are general assigned to the earliest Iron Age, at a time when there is a transition from bronze to iron tools - generally between the 8th and 5th Centuries BC. 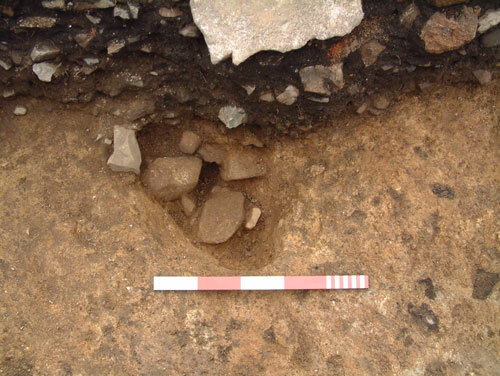 Such a find in Bone Passage once again displays the importance of the site in its wider landscape during the Iron Age and it is also important to note here that it was recovered from the same area in Bone Passage where we recovered the socketed iron adze. Below the paved layer where we recovered the axe, we have uncovered a rich deposit of animal bone - at the south end of Trench 17. This comprises butchered cow bones including limb and scapula elements and an almost whole red deer antler, with a part of the skull attached. Quite a large sherd of well-fired pot was also recovered from this deposit, which contains large grit inclusions and a slight turned-out rim. Updates should be more regular now that the specialists meeting and seminar have passed by. 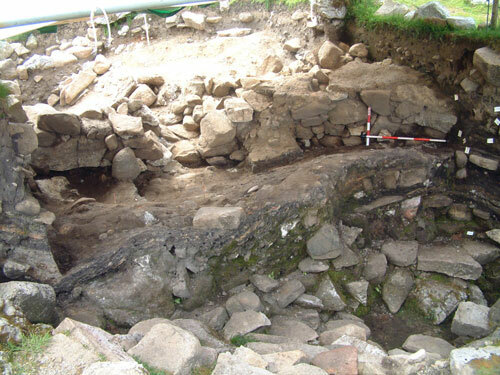 Therefore, visit again soon for updates on fieldwork at the site and for specialists reports relating to post-excavation analysis from the 2006/07 season.